I’m still stuffed from an amazing Thanksgiving dinner here in Shenzhen last week, hope everyone had an amazing holiday too. Was a business as usual workday in China though so most people had no idea why we were having a dinner party on a Thursday night! What is in common with Alibaba, Uber, and AirBnB? 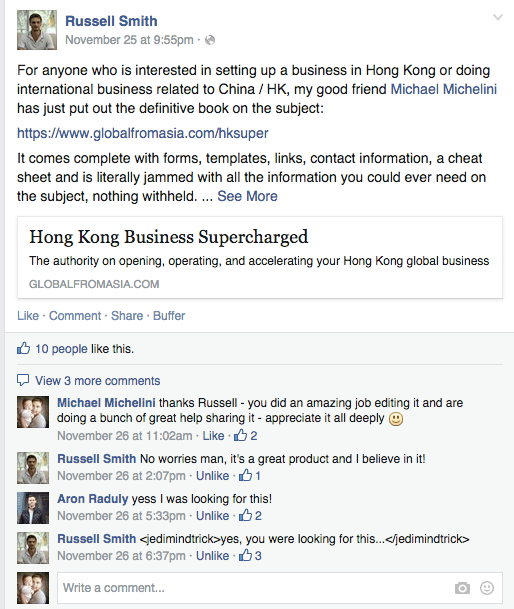 And Russell Smith, the talented editor who helped edit the HK Supercharged book, gave me a great review on his Facebook wall (and I didn’t incentivize him at all – can’t figure out how to link to a facebook post so here’s a screenshot, thanks buddy! Photo of the Week: So happy Movember is over, got to shave off my “barely showing” moustache and beard.